Have you ever wondered where your Favorite Disc Jockey's have worked, or where they are now? Check out this Great Site, and you may be suprised! Just Click on the Button. You can Listen to this Station on the Internet. I listen all Day at Work! or anytime on the Internet. All kinds of fun on this Site. Free search engine submission and placement services! 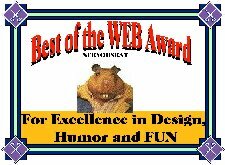 Rick's Place was named Best of the Web by Rob's World.